Veeam Backup Validator utility does not work with backups stored on scale-out backup repositories. Specify a name or an ID* of the backup file that you want to validate. Specify one or more backup files (VBM, VBK, VIB, VLB). To access files on a network share, specify account credentials. If you want to validate files located on different shares, make sure this account has access rights to all these shares. Specify a name of the VM in the backup file that you want to validate. If not specified, Veeam Backup Validator will check all VMs in the backup file. If not specified, Veeam Backup Validator will verify the latest restore point. Specify the date when the restore point that you want to validate was created. For the mm/dd/yyyy format, specify 08.30.2012. For the dd/mm/yyyy format, specify 30.08.2012. Specify approximate time when the restore point you want to validate was created. Specify this parameter if you want to run validation in the silence mode. Specify this parameter if you want to skip VMs listed in the vmname parameter. Specify this parameter if you want to generate a report on validation results and store it at the specified path. Supported report formats are HTML and XML. * You can get IDs of backup jobs and restore points from the Veeam Backup & Replication database, for example, using scripts or using Management Studio. 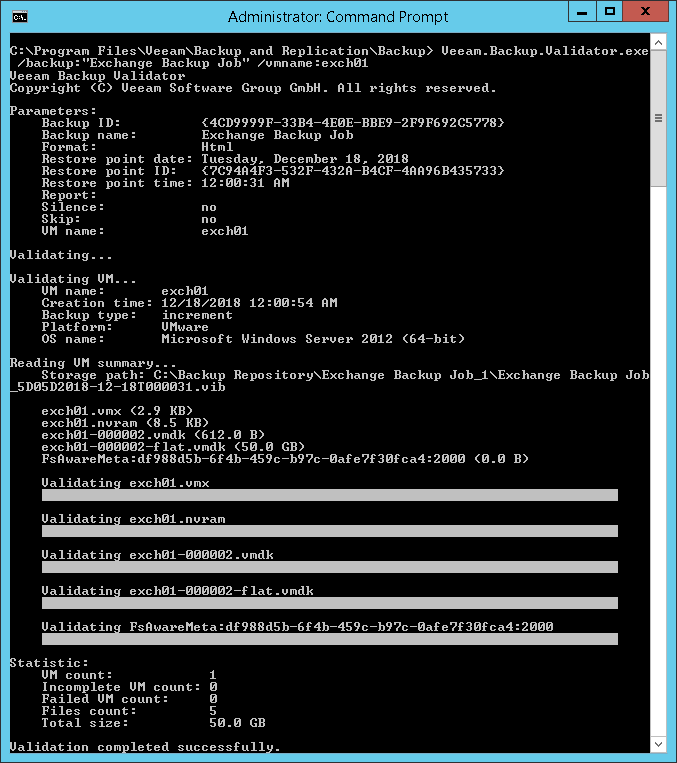 This command validates the exch01 VM in the Exchange Backup Job file. 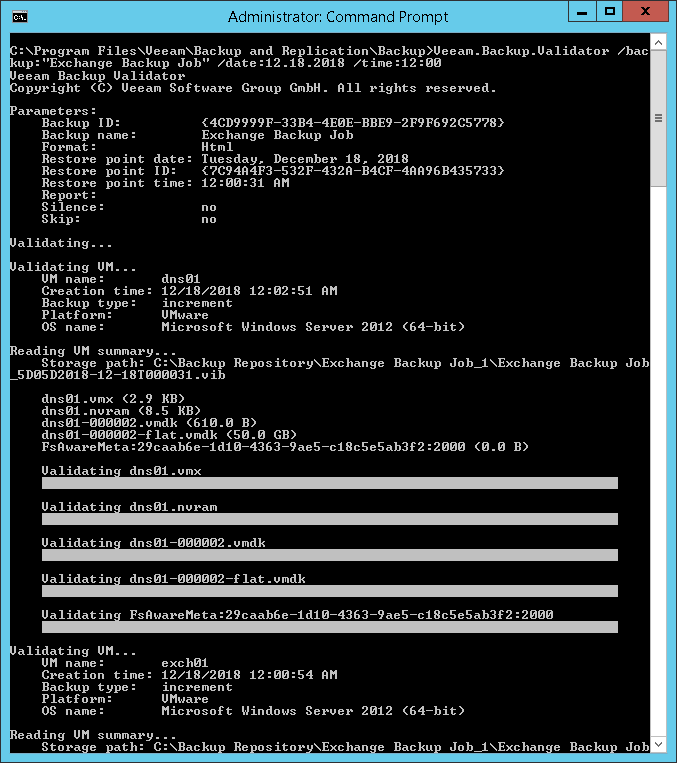 This command validates all VMs in the Exchange Backup Job file created on December 18, 2018 around 12:00 AM.